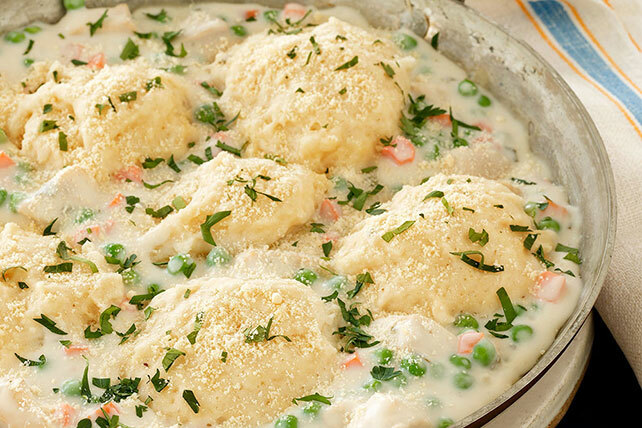 There really is nothing better than homemade Skillet Chicken & Dumplings. Discover it again—or for the first time—with this easy, yet delicious, version. Heat oil in large deep skillet on medium-high heat. Add chicken; cook and stir 4 min. or until no longer pink. Transfer to bowl. Add broth gradually to flour in small bowl, whisking constantly until blended. Add to skillet; cook and stir on medium heat 2 min. or until thickened. Add cream cheese spread; cook and stir 3 min. or until melted. Remove from heat; stir in chicken and vegetables. Stir baking mix, sour cream and milk just until baking mix is moistened. Spoon into 6 mounds over mixture in skillet; cook on medium-high heat 2 min. Cover skillet; cook on low heat 15 min. or until chicken is done and toothpick inserted in dumplings comes out clean. Substitute 2 cups any frozen mixed vegetables for the peas and carrots.